A Japanese garden design should be a response to nature. Your success in the design and implementation of this garden style will be determined by how well it is woven into the fabric of your landscape. Selection of the space and the details you include in your design will also influence the realization of your dream. The Japanese technique of garden design offers five basic styles. The Tea Garden (Chaniwa) is a popular design approach and is occasionally combined with one of the other styles; Courtyard, Stroll Style, Hill and Pond, and Dry-Landscape or Zen Style. 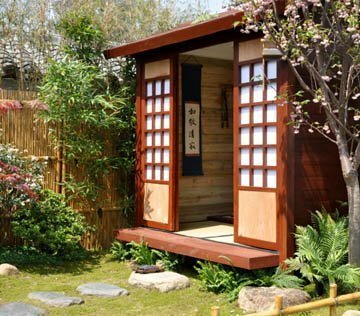 Primary elements found in a Japanese garden include a roofed structure or teahouse with a bench or built in furniture arrangement used for the tea ceremony. A roji or ‘’dewy path” of stepping-stones lead to the enclosed inner garden and offers the opportunity for reflection and contemplation. The size and arrangement of stones for the path slow ones pace and add to the illusion of a larger space and greater distance. Moss planted adjacent to the stone path as well as plantings of ferns and soft evergreens provide a soothing journey to the tea house. The creation of a Japanese garden follows the design principle of “form follows function”. Garden features including weathered Japanese lanterns, a water basin fed by bamboo water pipe, a bamboo gate, and variations of natural rock arrangements are all functional elements of design as opposed to strict ornamental use. Other elements that reinforce the design of a Japanese garden include screens, walls, and fences which provide separation, privacy and the opportunity to employ bamboo plantings or cut bamboo for structures. Tall and dwarf forms of bamboo provide airy textures and rustling leaves for constant movement and sounds associated with this garden style. The selection of plants available for use in Japanese gardens is considerable in our climate. Literally hundreds of plants with the subtext japonica and plants that include the word Japanese in their name are all potential candidates for inclusion in the Tea Garden. A few specifically selected and well placed plants can reduce the maintenance requirements of your garden, and a true Zen garden may contain no plants at all. The Sarah P. Duke Gardens and the JC Raulston Arboretum each offer an Asian garden for you to stroll through and collect ideas for your own garden. There are many books and sources of design inspiration available to guide you. Consider quiet meditation in the serenity of the space you have designated for your Japanese garden to help guide your design.